Get close enough to pet your new friendly dolphin buddy! During your 2.5 hour excursion, you’ll be taken by boat from Port Lucaya out to an area of beautiful coral gardens that line Grand Bahama Island where you can explore the colorful reefs that are loaded with lively tropical fish and marine life. 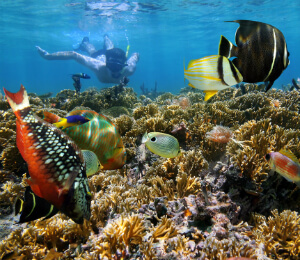 Angelfish, Butterfly Fish, Tang, Eagle and Manta Rays, Barracuda, Nassau Grouper, and many more species can be expected to be seen around the corals in our area at any given time. There’s also a certified scuba dive master on board to provide any necessary instructions for snorkeling to help ensure that your snorkeling time is enjoyable and safe. After the snorkeling time has ended, it’s time to head back and meet your new dolphin friend! In the dolphin experience, you’ll be introduced to the staff and one of our trained Atlantic Bottlenose Dolphins. The trainers will explain facts about the history of our facility and provide knowledge about the anatomy and behavior of these amazing mammals. It’s then time for the real show of ability when your trainer sends the dolphin into action! Our professional photographer will be on hand to catch the dolphin walking on water past you or posing in front of you, or maybe in mid-air as the dolphins love to flip and fly across the pool. We also invite you to pet the dolphin as it swims by so you can feel just how smooth these guys really are. Please bring your email confirmation, towels and sun screen. Will I be snorkeling with dolphins? No, you will just snorkel at the reefs and then head to the dolphin sanctuary for the meet and greet. The tour is split into two segments. All guests must be at least 5 years old and know how to swim in order to participate. Anyone under the age of 18 years old must be accompanied by a participating adult, parent, or guardian. Pregnant women and guests with heart conditions are not permitted. Bahamas Dolphin Encounters is always interested in your tour experience with us. We hope you enjoyed your tour and love to hear comments. I have been to the Bahamas many times, but Freeport Snorkel and Dolphin Experience is one of my favorite trips! It includes everything that everyone should do here. As a Bahamas veteran, I can say only the best about this experience!